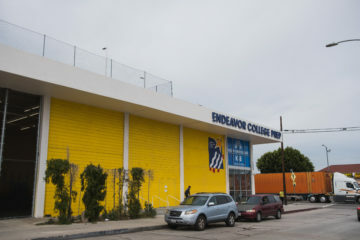 Boyle Heights and East Los Angeles have the highest rate of homes with hazardous levels of lead contamination from the shuttered Exide Technologies battery recycling plant in Vernon, an analysis of newly-released government data by the Los Angeles Times shows. Homes in Boyle Heights are also among the ones that have waited the longest for a cleanup, according to a story published Thursday. Authorities looked at lead contamination in a 1.7 miles radius from the battery recycling plant, which spewed deadly contaminants into the air for 30 years before it was closed down in 2015. They looked at lead deposited in some 10,000 properties and found more than 7,500 that exceeded California’s standard for residential soil, which is 80 parts per million. A controversial plan announced last July by the DTSC expects to remove contaminated soil from only the 2,500 most-polluted properties –those with levels over 1,000 ppm– using a $176 million fund proposed by Governor Jerry Brown in 2016. Community activists have decried the cleanup plan, demanding funds to cleanup all of the properties that exceed the state standard and to extend testing to a larger area around the Vernon plant. The Times analysis found the highest rates of lead contamination were found in a cluster of homes in an area North of the plant, on both sides of South Indiana Street, on the border between Boyle Heights and East Los Angeles. It found dozens of blocks where more than half of the homes meet the cleanup criteria. On the 3500 block of Percy Street, for instance, the Times found more than half a dozen parcels with lead levels in excess of 1,000 ppm, and several others with levels over 800 ppm. 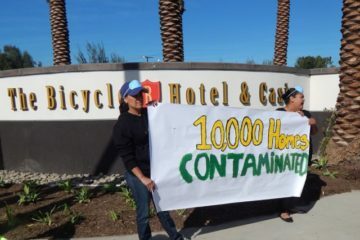 To date, just 270 properties around Exide have been cleaned, the majority immediately after the plant was shut down. 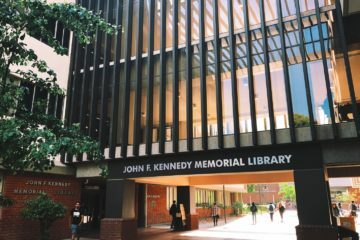 The Times reports there is no start date for the cleanup plan that was supposed to begin last summer and which was delayed by contracting problems. 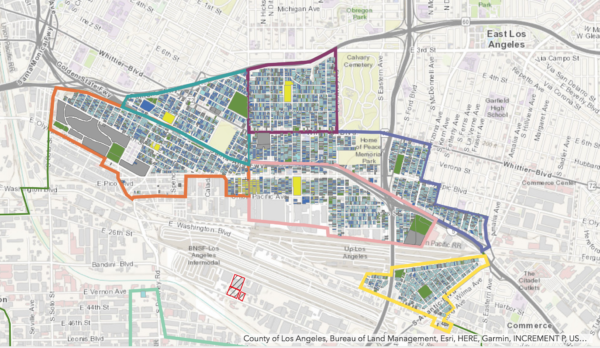 Examined data reveals that residents in Commerce and Boyle Heights have waited the longest for cleanup since tests detected lead at their homes, with a median wait time of 18 months or more. Some of the best reporting on the Eastside is done by the Boyle Heights Beat. Thanks for keeping me informed. Thanks, but we do not take credit for the reporting on this post. This is based on great story by our colleagues at the Los Angeles Times.